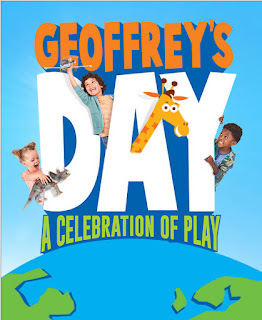 Savvy Spending: Toys R Us: Geoffrey's Day is Saturday, 7/15! A celebration of play, in stores from 1-3 pm! Toys R Us: Geoffrey's Day is Saturday, 7/15! A celebration of play, in stores from 1-3 pm! This Saturday, July 15th, Toys R Us Stores will celebrate Geoffrey's Day from 1-3 pm. Kids ages 5 and up can try out new toys and games like Pie Face Sky High and Rock ‘Em Sock ’Em Robots, get free coloring sheets, free stickers and a free giraffe crown and take pictures with Geoffrey! Go here to RSVP and secure your spots!